Maybe you’ve seen the above ad. Maybe you haven’t. 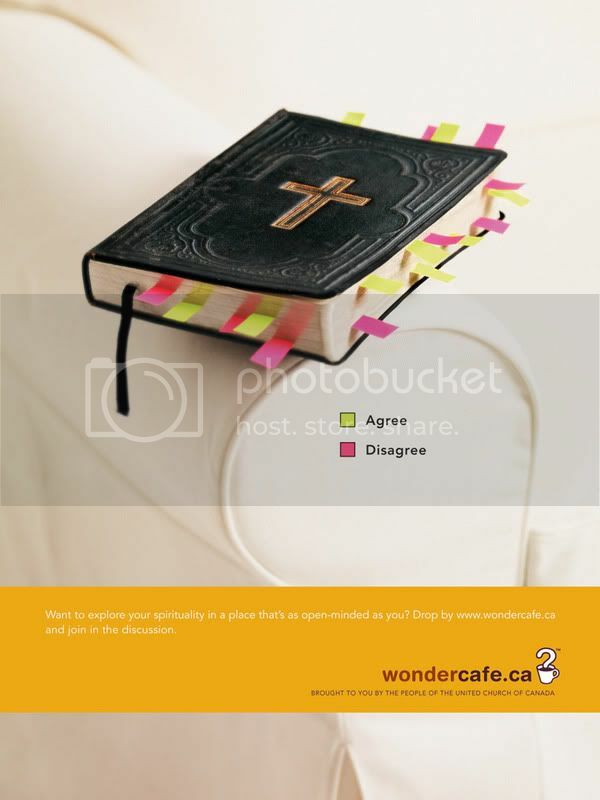 It’s part of a new controversial and irreverent campaign put together by the United Church of Canada. The church needs to renew its steadily aging congregation and they’re targeting a younger, more liberal audience that already sees itself as Christian but doesn’t necessarily attend church, and they’re going to run the ads in newspapers and magazines across the country. If the UC were removed from the elements, what’s left is a series of cute and well intentioned PSAs, like the ones kids watch on Saturday mornings. 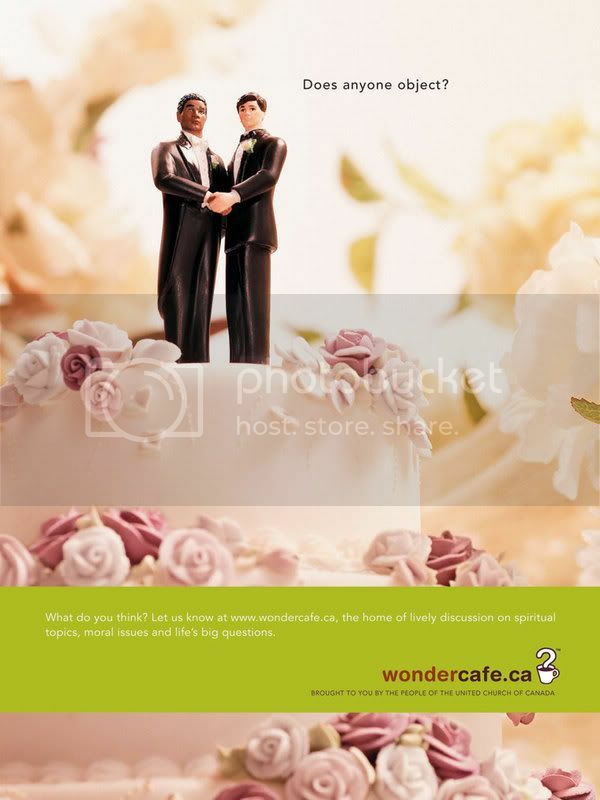 Really, two grooms on a wedding cake? That would’ve been controversial ten years ago, but now? Maybe if one of the grooms was in drag. Maybe. A bobble-headed Jesus? C’mon, I’ve had a Buddy Christ for I don’t know how long. The efforts are well meaning and chuckle-worthy, but hardly bleeding edge. I’m not surprised though that it’s the UC who’re backing this initiative. Of all the Christian denominations they’re much more liberal than the others. Hell, of most religions the UC are pretty cool with most things. Gay marriage? Sure. Female priests? Big deal. In their own unique way the UC are arguing against metanarratives in Christian belief and practice. That’s the real brilliance of this campaign: it turns religious teaching on its side. In effect, it argues that religion needs to keep pace with society, not the other way around. The campaign also says that you don’t need to take the bible as — pardon the pun — gospel to be a good Christian. Brotherhood (or sisterhood) and a belief in God is all you need to be righteous. A social message that a certain cat born in a manger might espouse.